When your vehicle has shiny chrome rims, its appearance will be greatly enhanced whether it is brand new or an older car. When your chrome rims need to be repaired, you will want to refurbish your rims with results that look professional, bringing them back to the same appearance as when they were new. In some cases, you may be able to make them look even better than they did when they came straight out of the factory. Restoring your chrome rims is not terribly difficult when you use chrome spray for rims. You can easily do so by following some straightforward steps using your PChrome spray. If there is tarnish on your rims, they are made out of polished aluminum. You can use a tarnish remover to remove tarnish from their surfaces. You will want to thoroughly clean your rims so you can both prepare the surfaces as well as determine how extensive the damage to them is. You will want to wash them using warm water, a mild detergent and a soft sponge. After you have removed as much of the dirt and debris you possibly can, let them dry and then use a coarse cloth to wipe away any dirt or debris that is left behind. After your rims are free from visible dirt and debris, use your rubbing alcohol and a soft cloth to wipe them down. You may need to do this several times in order to completely remove all of the dirt. If there is surface rust, you can continue removing it with the soft cloth and rubbing alcohol. Finally, dry them off using a clean cloth or an air blower to make sure that no water spots are left behind. If your rims have gashes or deep dings in them, you can apply hard epoxy to fill them in. Once the epoxy drives, smooth it out using a buffing cloth. Smooth out the entire surface and any rough spots with a buffing cloth. Then, using your fine-grit sandpaper, rough up the entire surface of the rims so the chrome spray will be better accepted. Before applying your base coat, you will first need to mix your chemical solutions. Your PChrome kit should have come with four different solutions that are labeled as S, R, D and W. You should also have several spray bottles in which you can mix the solutions. For the S, R, and D solutions, you will mix one part of each solution to 30 parts of deionized water. The ratio for the W solution is four parts of the solution to 30 parts of deionized water. Make sure you have taped up your tires around the edges of your rims so that the spray paint will not splash on the tires. Lay them down flat on sheeting before beginning the application of your PChrome spray. Then, mix your 2KA base coat with your 2KB hardener in equal amounts. To this, you will add 20 percent of your 2K black reducer. Make sure that you have already primed the surfaces of your rims using a good-quality primer. Using your spray gun, spray your rims from the bottom to the top using horizontal motions with your base coat solution. Clean out your gun with acetone and let the base coat cure for about 24 hours. In order to chrome your rims, sensitize the surface after the base coat has fully cured by liberally spraying them with your W solution. Then, use your single-nozzle spray gun to spray them with your D solution and then rinse them with deionized water. Repeat the applications of your W solution and your D solution followed by the deionized-water rinse. Without allowing the surface to dry, immediately use your S and R dual nozzle spray gun to apply your chrome, working your way from the bottom to the top of each rim. Continue applying until you have achieved the desired effect. 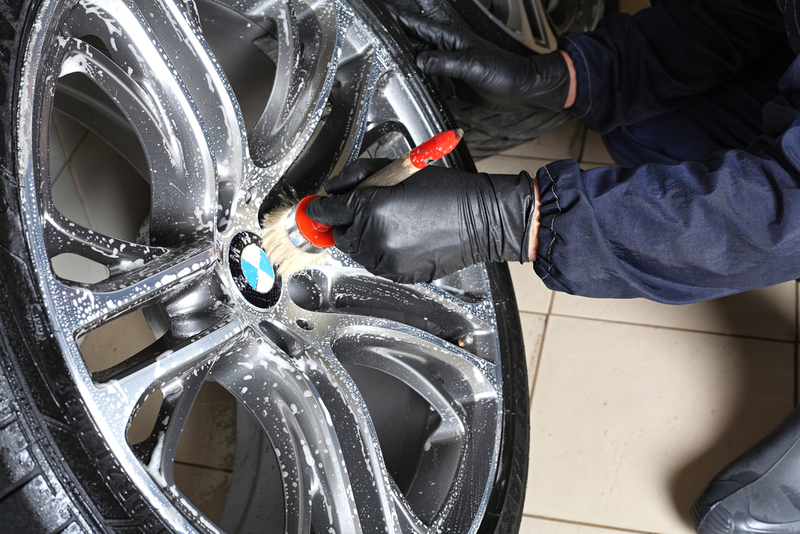 using your air blower, blow off all water droplets, and allow your rims to thoroughly dry. The top coat mixture is made up of equal parts 2KA top coat and 2KB hardener combined with 20 percent of your 2K clear reducer. For every 125 milliliters of the mixture, add 1 ml of violet to keep them from having a yellowing effect. Apply your mixture from the bottom to the top using light passes. After letting it dry and harden for about 48 hours, you can reapply a second top coat if you want to do so. When you are finished, you can buff your newly chromed rims using a buffing cloth to make them shine even more brilliantly. 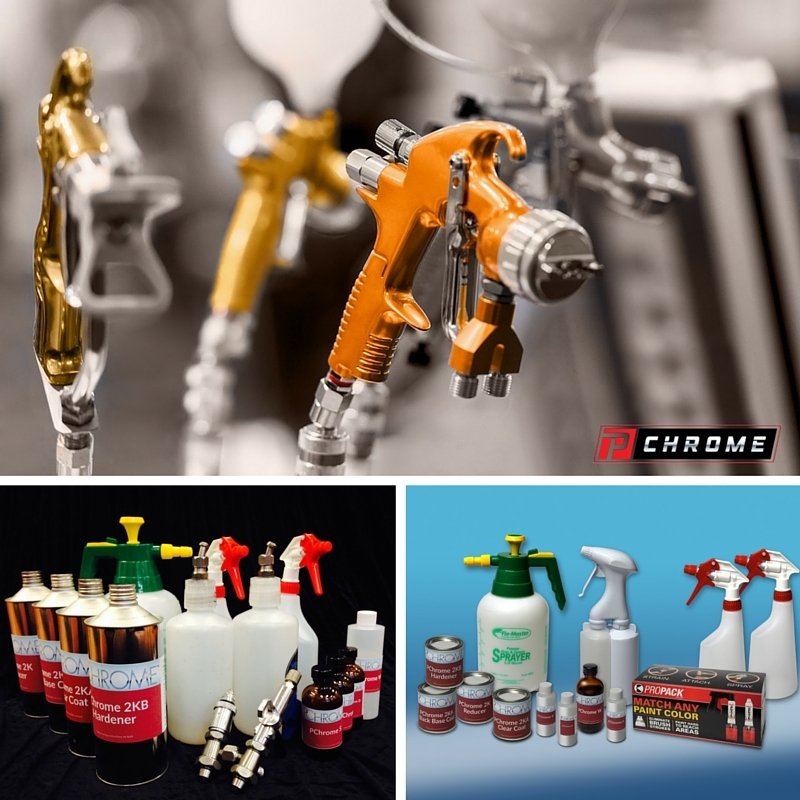 Always remember to clean your spray guns with acetone so that they are ready for your next chroming project. If you would like to order your chrome spray for rims, call us today or order your kit online. With PChrome, you can bring back to life scuffed, dull wheels and rims, headlamp casings, bumpers, grills, rearview mirrors, exhaust pipes and any other detail that you wish.